The Judiciary comprises two types of court venues; a corporate “administrative court”, and a Common Law “court of record”. A judge in an “administrative court” does not act judicially but as an administrator to settle contractual disputes. A judge in a “court of record” sits judicially with a “jury of the People” to remedy harm to other living people. The courts are attended by “Commercial List Judges”, some of whom are designated as “jury” judges able to sit in a Common Law “court of record”. Common Law acknowledges the LAWFUL Rights possessed by living Men and Women. Statutes prescribe Legislation to administer artificial LEGAL “Persons”. 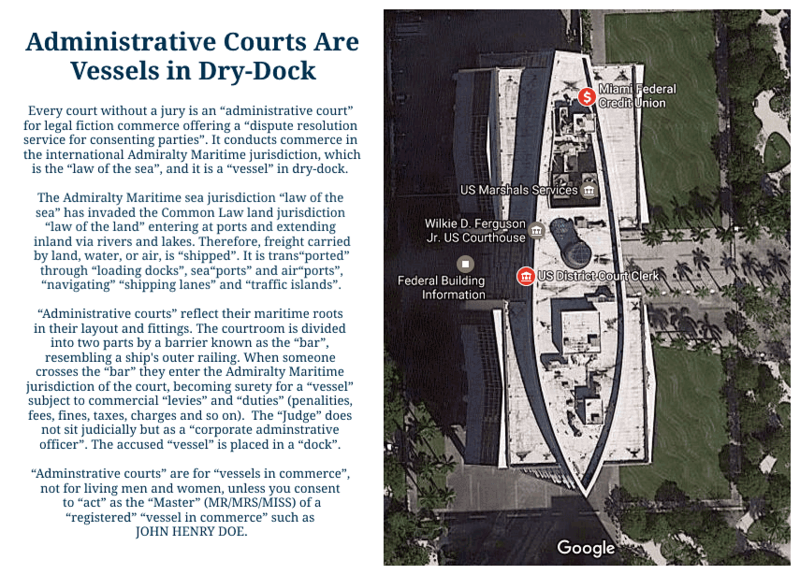 A Statutory “administrative court” is for commerce, in practice (de facto). It is a place of corporate banking offering “a dispute resolution service for consenting parties”, where living men and women (unwittingly) consent to be joined to (joinder) artificial legal “persons”, obligated to settle the accounts of commercial (adhesion) contracts. The Judge does not sit “judicially”, but acts as a corporate “administrative officer”. “Administrative courts” are not sanctioned by Parliament, and are not part of the de jure laws and usages of the realm. All “administrative courts” are UNLAWFUL because they do not have a jury present. ANY COURT WITHOUT A JURY PRESENT IS AN ADMINISTRATIVE COURT! A Common Law “court of record” is for justice with a jury, in law (de jure). It is a place of real world criminal evidence where a jury of one's peers examines what is true in fact, in order to determine what is right or wrong, just and fair. The parties are living men and women, and their decisions attempt to remedy harm or loss suffered by one or more injured parties, and to provide protections for living people and their community of life. The Judge sits “judicially”. The only venue of “justice” for a living man or woman is a Constitutionally sanctioned Common Law “court of record” with a jury of one's peers. “Administrative courts” are collection and enforcement agencies for the “Crown”, where a man or woman may contract to “act” in the fictional “role” of an “artificial person” to deliver a “performance” in the “theatre of commerce”. Spectators can usually view the drama from a gallery. The attending Bar Association members are corporate officers. All members of the private Bar Association swear an Oath to serve the Bar Association, which presents a conflict of interest in matters of de jure governance and justice. This subversion of the Common Law courts supports the crime of “personage”, which is misrepresenting a living man or woman as a fictional “person” causing unwitting “joinder” to the “artificial person” NAME. The crime of “personage” is compounded by “barratry”, the crime of bringing false claims in court. The term “barratry”, appropriately, comes from the “Bar Association”. All Bar Associations throughout the world are signatories and franchises to the International Bar Association of the Crown Temple, located within the 677-acre, independent sovereign state known as The City of London, or simply “The City.” The bonded indebtedness of YOURNATION (INC.) is held by this “Crown”. Any court without a Constitutionally sanctioned jury of one's peers, is a “Crown” court. Consensus facit legem. Consent makes the law. A contract is a law between the parties, which can acquire force only by consent. Qui tacet consentire videtur. A party who is silent appears to consent. Non videntur qui errant consentire. He who errs is not considered as consenting. Disparata non debent jungi. Unequal things ought not to be joined. The content of this website is provided for educational purposes, omissions and errors excepted, and is not legal/lawful advice. Ei incumbit probatio qui dicit, non qui negat. The burden of the proof lies upon him who affirms, not he who denies. Incerta pro nullis habentur. Things uncertain are considered as nothing. Falsus in uno, falsus in omnibus. False in one thing, false in everything. Quaelibet jurisdictio cancellos suos habet. Every jurisdiction has its boundaries.